Have you heard the term “analytics economy” and wondered what it means? Or maybe you’ve wondered how your organization can use data and analytics to achieve economic gains. Now we have more than just data. We have accessible data, fueled by advances in compute power and connectivity, and interpreted by ever-more powerful analytics. 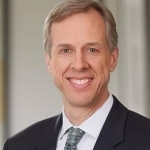 At SAS, we’ve been talking about the analytics economy a lot lately. So naturally, people ask me what exactly we mean by that. After all, we’ve been talking about "data everywhere" since the big data craze a few years ago...so what’s new now? The key change is that now we have more than just data. We have accessible data, fueled by advances in compute power and connectivity, and interpreted by ever-more powerful analytics. In the analytics economy, each insight sparks the next, and the value of insights compound just like interest on a savings account. Economies are built on value, and the value of the analytics economy resides in new opportunities nurtured by the democratization of analytics. Now we’ve made analytics easier for everyone to use, from data scientists to business users to executives. In this new economy, disruption and innovation can come from anywhere. Software companies are disrupting traditional business models, non-“techies” are writing apps and digital transformation is enabling organizations to monetize their big data. 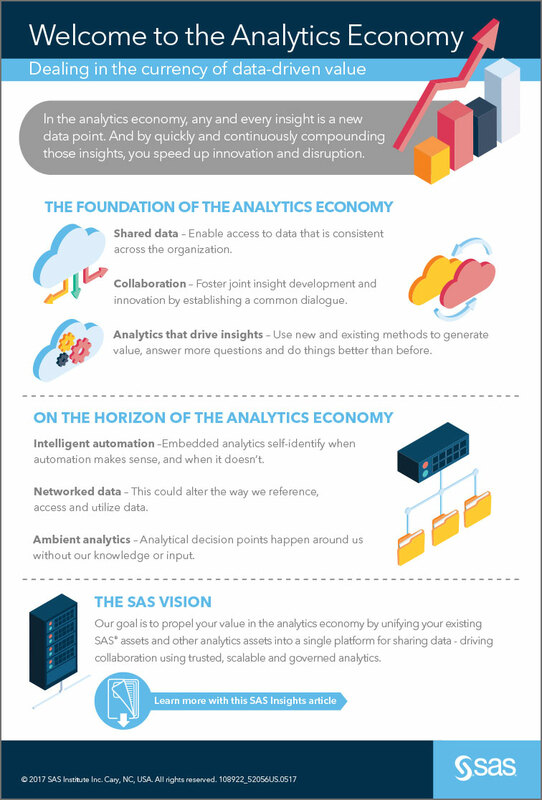 So SAS is talking about the analytics economy because now is the time for you to capitalize on it. And we believe the key to helping you do that is a best-in-class analytics platform. A platform allows you to quickly create value from your data by seamlessly moving through the analytics lifecycle, perfecting the path from data to decisions. This week at Analytics Experience in Washington, DC, we will continue to talk more about the SAS Platform – a software foundation engineered specifically to generate insights from data, in any computing environment, and that can support every phase of the analytics life cycle. What really excites me about Analytics Experience is the more than 150 breakout sessions, hands-on workshops, table talks and how-to demos where attendees will get insights straight from the source. Experts from Cox Automotive, Dow Jones, GE Transportation, Google, Honeywell, the Kellogg Company, Lockheed Martin Aeronautics, LinkedIn, Procter & Gamble, the University of Texas at Arlington and more will all be there to share how they are thriving in the analytics economy. The analytics economy is a new era of change, some of it incremental, and some of it truly disruptive. Just as the Internet rocked our world and affected every aspect of society, now it’s time for analytics to do the same. Can’t make it to Washington, DC? You can still tune in to watch a livestream and archives of the main stage presentations and select breakout sessions.